During the spring of last year, we went on A Weekend To Remember marriage getaway. It is a marriage conference organized by FamilyLife that teaches couples how to have a successful marriage and a family. Usually, couples with problems visit such retreats. We did not have any problems in our marriage, but I, being a planner, decided to prepare us for the challenges ahead. My husband David, luckily, did not object to it at all. It was a wonderful conference, and we learned a lot. I will be talking about some of the principles we discovered there in the later posts, but today I wanted to share a book that we got at that marriage retreat. 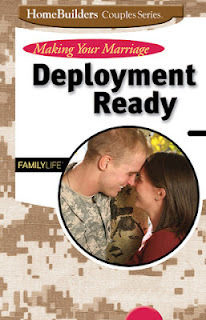 It is Making Your Marriage Deployment Ready: Drawing Together When Duty Calls You Apart by Mike and Linda Montgomery and Keith and Sharon Morgan. The book consists of six different sessions that address various aspects of upcoming deployment. Even though David's deployment is coming up, we started going through the book last weekend. We will be lucky if we have enough weekends together before he leaves to go through all six sessions. The first session is about Deployment Threats. 1) Uncertainties and difficult adjustments: I do not know many people who like change. If you are like us, then change is good in small quantities and very rarely. If change were easy to embrace, people would have already stopped smoking, lost all the extra weight, and got their dream jobs. Deployment, just like any separation, will definitely bring the need to be flexible into the lives of both the deployed spouse and the one staying at home. For him, there will be a need to adjust to sleeping on the ground, to eat MREs (Meals Ready to Eat), to inhale the dust of Afghan desserts, and to the fact that there will be no easy access to the Internet. For me, there will be challenges of learning how to fall asleep alone, pay the bills, and take out the trash. We both will need to learn how to live by ourselves again. The most important thing is to realize that this is temporary, and that eight months is just a tiny fraction of our life together. Do you think challenges of separation cause problems or reveal them? I think it can be both. If a couple has not been together for too long, hard times can create problems, since the two people have never faced difficult circumstances. However, if the problems already exist in a marriage, long separation can alienate spouses and make things worse. 2) Selfishness: Separation makes it so easy to focus on yourself rather than your partner. You don't want to make him a sandwich for lunch? You don't have to! You can always go out and not worry about what he is eating. You don't want to watch anime? Guess what: you can easily watch an episode of House, M.D. or Office instead. He is not there to constantly remind you that you need to cook, clean, do laundry, etc. In fact, there is no one watching you, so you can completely concentrate on your heart's desires. However, Phillippians 2:3-4 teaches us that we should "3 Do nothing from selfish ambition or conceit, but in humility count others more significant than yourselves. 4 Let each of you look not only to his own interests, but also to the interests of others." Instead of falling into the trap of selfishness, I need to focus more on my spouse. I am planning to write him real letters every day, as I did during the first deployment. I will be sending him care packages and my pictures. I know that taking time and making an effort will count a lot for him and will let him know that he is still an important part of my life. 3) Poor communication: Many couples who live under one roof all the time suffer from poor communication. The fact that there are thousands of miles between you and your spouse does not make it any easier. There will be a huge time difference between you. There will be only one computer available to 40 deployed guys who need to write home. He won't be able to send you real letters. There will be base lockdowns for several days when there is absolutely no communication available (and allowed) with the outside world. Understanding these unique challenges can help the staying-at-home spouse keep calm and make an extra effort to communicate. He won't be able to see my sad eyes or tired face and instantly understand that I am not feeling well. I need to communicate that clearly when we get a chance to talk. During the last deployment, I tried to keep some things that bothered me to myself, so he would not worried about me. Women know that sometimes things that make us upset are not really that important and can be left unmentioned. If you want to make your marriage a priority, let your spouse know that he is still the head of your family. You are just temporarily fulfilling his duties here, at home, while he is fulfilling his Duty to the Country far away. Focus on him, concentrate less on yourself. Show him that you love him through letters and care packages. Your love and support will warm up his soul during the cold Afghan nights like no sleeping bag ever will.